Figure 4 illustrates the excitation and emission spectra of a single fluorochrome, overlaid on the same graph. Percent transmission is plotted as a function of excitation and emission wavelength. Described below are several general characteristics of fluorescence spectra and how they pertain to fluorescence microscopy and filter design. Figure 3: Generic excitation and emission spectra for a fluorescent dye. First, although some substances have very broad spectra of excitation and emission, most fluorochromes have well-defined bands of excitation and emission. The spectra of Figure 4 are a typical example, and the difference in wavelength between the peaks of these bands is referred to as the Stokes shift. 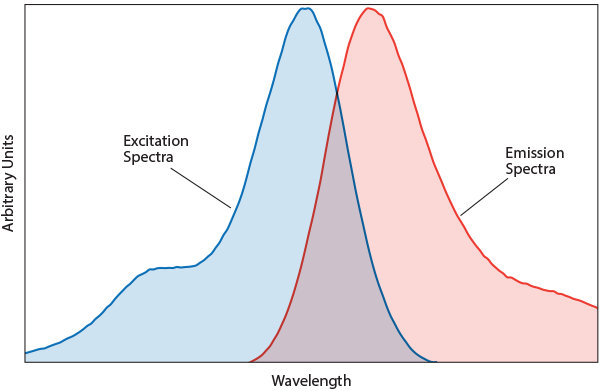 Second, although the overall intensity of emission varies with excitation wavelength, the spectral distribution of emitted light is largely independent of the excitation wavelength. Third, the excitation and emission of a fluorochrome can shift with changes in cellular environment such as pH level, dye concentration, and conjugation to other substances. Several dyes (FURA-2 and Indo-1, for example) are useful expressly because they have large shifts in their excitation or emission spectra with changes in concentration of ions such as H+ (pH level), Ca2+, and Na+. Please note that spectra are measured in a standardized, non-cellular environment. A cellular environment, for the reasons outlined above, may affect the accuracy of the reported spectra for a given fluorochrome. Lastly, there are photochemical reactions that cause the fluorescence efficiency of a dye to decrease with time, an effect called photobleaching or fading. These spectra are generated by an instrument called a spectrofluorimeter, which is comprised of two spectrometers: an illuminating spectrometer and an analyzing spectrometer. First the dye sample is strongly illuminated by a color of light that is found to cause some fluorescence. A spectrum of the fluorescent emission is obtained by scanning with the analyzing spectrometer using this fixed illumination color. The analyzer is then fixed at the brightest emission color, and a spectrum of the excitation is obtained by scanning with the illuminating spectrometer and measuring the variation in emission intensity at this fixed wavelength. For the purpose of designing filters, these spectra are normalized to a scale of relative intensity.